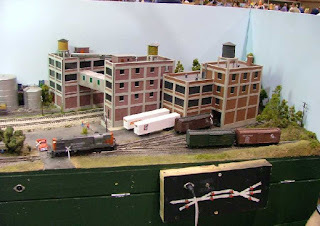 A corner of the 12th Street Yard layout by the ACT Model Railway Society. This small feature on a larger layout could be built and operated as a small layout in its own right. An interesting combination of two small layouts in one, forming a continuous run. Each side can be operated as a small layout in its own right or you can just sit back and enjoy watching the trains run around. A clever small layout by Martin Murden featuring a terminus and train table.